The assisted pullup machine helps you do pullups alone. If you find pullups impossible to do, you are not alone. A study from researchers at the University of Dayton published in 2003 in Research Quarterly for Science and Exercise, tested and then trained women with the intention of having them perform a pullup at the end of three months. After focused training three times per week for the 12 weeks, only four of the 17 participants could successfully pull up their body weight for one repetition. 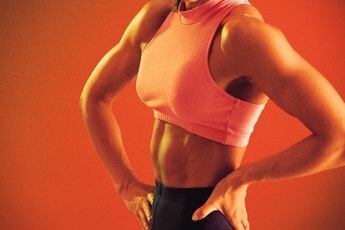 Women seem to be at a disadvantage when it comes to this muscle-building move, but you don't have to give it up altogether. Instead of skipping pullups, use the assisted pullup machine to target multiple muscles of the upper body. To use the assisted pullup machine, first adjust the weight pin. 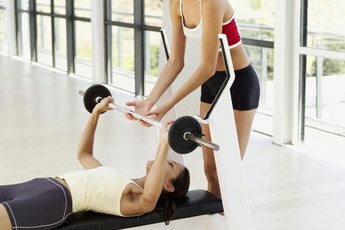 Unlike other weight machines, you should put the pin at a heavier weight, rather than at a lighter weight, when you are just starting out. The amount of weight is how much assistance you are receiving from the machine. For example, if you place the pin at 80 pounds and weigh 140, you are pulling up the difference -- or 60 pounds. Place the pin at 60 pounds and you are pulling up 80 pounds. Once you set the weight, step up onto the top step and grasp the bar with an overhand, wide grip. Put your feet or, if it is a kneeling-based machine – your knees, onto the platform. Brace your arms and upper back because you will drop down immediately. Pull yourself up using your back and arms. Keep your abdominals tight, and avoid swinging your body. Lower slowly to complete one repetition. The primary muscle targeted with the assisted pullup machine is the latissimus dorsi. This broad back muscle extends along the lower back, behind your ribs. Its primary function is to pull the arms down and back while keeping the elbows in toward the body. A pullup is a near-perfect way to train the lats because the action of pulling yourself up to the bar bends the elbows close to the body as you contract the shoulder blades together. The pullup, even from the assisted machine, is a compound exercise that requires assistance from numerous other muscles of your upper body. The forearm muscles of the brachialis and the brachioradialis activate to keep your grip strong. Your biceps help give you strength as you bend the elbow. The upper back muscles of the rhomboids, lower trapezius and the teres major help the lats with pulling the arms down and back. Both the pectoralis major and pectoralis minor, the muscles of the chest, assist with the lifting action. Stabilizing muscles help the keep the joint secure during compound movements. During the assisted pullup, the triceps stabilize the elbow joint. Do not rely on the assisted pullup to train the triceps at the back of the upper arm, however. Kickbacks, dips and press-downs are more effective at targeting this muscle in an active way. Research Quarterly for Exercise and Sport: Training College-Age Women to Perform the Pull-Up Exercise. Are Triceps Dips Safe for Shoulders?